Contrast and Resolution, intricately linked. This is one of those topics that keeps coming back around time and time again. The link between contrast and resolution. So I thought I would take a few minutes to create some simple illustrations to demonstrate the point. This first image represents a nice high contrast picture. The white background and dark lines have high contrast and as a result you can “see” resolution a long way to the right of the image as indicated by the arrow. Now look at what happens as you slowly reduce the contrast in the image. As the contrast reduces the amount of resolution that you can see reduces. Keep reducing the contrast and the resolution continues to decrease. Eventually if you keep reducing the contrast enough you end up with no resolution as you can no longer differentiate between light and dark. Now look at what happens when you reduce the resolution by blurring the image, the equivalent of using a less “sharp” lower resolution lens for example. What happens to the black lines? Well the become less dark and start to look grey, the contrast is reducing. Hopefully these simple images show that contrast and resolution are intrinsically linked. You can’t have one without the other. So when choosing lenses in particular you need to look at not just resolution but also contrast. Contrast in a lens is affected by many things including flare where brighter parts of the scene bleed into darker parts. Flare also comes from light sources that may not be in your shot but the light is still entering the lens, bouncing around inside and reducing contrast as a result. These things often don’t show up if you use just a simple resolution chart. A good lens hood or matte box with flags can be a big help reduce stray light and flare, so in fact a matte box could actually make your pictures sharper. They are not just for pimping up your rig, they really can improve the quality of your images. The measurement for resolution and contrast is called the MTF or modulation transfer function. This is normally used to measure lens performance and the ability of a lens to pass the light from a scene or test chart to the film or sensor. It takes into account both resolution and contrast so tells you a lot about the lens or imaging systems performance and is normally presented as a graph of contrast levels over a scale of ever increasing resolution. When measuring the resolution of a well designed video camera, you never want to see resolution that is significantly higher than HALF of the sensors resolution. Why is this? Why don’t I get 1920 x1080 resolution from an EX1, which we know has 1920 x1080 pixels, why is the measured resolution often around half to three quarters what you would expect? There should be an optical low pass filter in front of the sensor in a well designed video camera that prevents frequencies above approx half of the sensors native resolution getting to the sensor. This filter will not have an instantaneous cut off, instead attenuating fine detail at ever increasing amounts centered somewhere around the Nyquist limit for the sensor. The Nyquist limit is normally half of the pixel count with a 3 chip camera or somewhat less than this for a bayer sensor. As a result measured resolution gradually tails off somewhere a little above Nyquist or half of the expected pixel resolution, but why is this? It is theoretically possible for a sensor to resolve an image at it’s full pixel resolution. If you could line up the black and white lines on a test chart perfectly with the pixels on a 1920 x 1080 sensor then you could resolve 1920 x 1080 lines. But what happens when those lines no longer line up absolutely perfectly with the pixels? lets imagine that each line is offset by exactly half a pixel, what would you see? Well each pixel would see half of the black line and half white line. So each pixel would see 50% white, 50% black and the output from that pixel would be mid grey. With the adjacent pixels all seeing the same thing they would all output mid grey. So by panning the image by half a pixel, instead of now seeing 1920×1080 black and white lines all we see is a totally grey frame. As you continued to shift the chart relative to the pixels, say by panning across it, it would flicker between pin sharp lines and grey. If the camera was not perfectly aligned with the chart some of the image would appear grey or different shades of grey depending on the exact pixel to chart alignment while other parts may show distinct black and white lines. This is aliasing and it’s not nice to look at and can in effect reduce the resolution of the final image to zero. So to counter this you deliberately reduce the system resolution (lens + sensor) to around half the pixel count so that it is impossible for any one pixel to only see one object. By blurring the image across two pixels you ensure that aliasing wont occur. It should also be noted that the same thing can happen with a display or monitor, so trying to show a 1920×1080 image on a 1920×1080 monitor can have the same effect. As the Nyquist frequency is half the sampling frequency of the system, for a 1920 x 1080 sensor anything over 540 LP/ph will potentially aliase, so we don’t want lots of detail above this. As Optical Low Pass filters cannot instantly cut off unwanted frequencies there will be a gradual resolution tail off that spans the Nyquist frequency and there is a fine balance between getting a sharp image and excessive aliasing. In addition as real world images are rarely black and white lines (square waves) and fixed high contrast patterns you can afford to push things a little above Nyquist to gain some extra sharpness. A well designed 1920 x 1080 HD video camera should resolve around 1000TVL. This where seeing the MTF curve helps, as it’s important to see how quickly the resolution is attenuated past MTF50. The resolution of the EX1 and F3 is excellent for a 1080 camera, cameras that boast resolutions significantly higher than 1000TVL will have aliasing issues, indeed the EX1/EX3 can aliase in some situations as does the F3. These cameras are right at the limits of what will allow for a good, sharp image at 1920×1080. 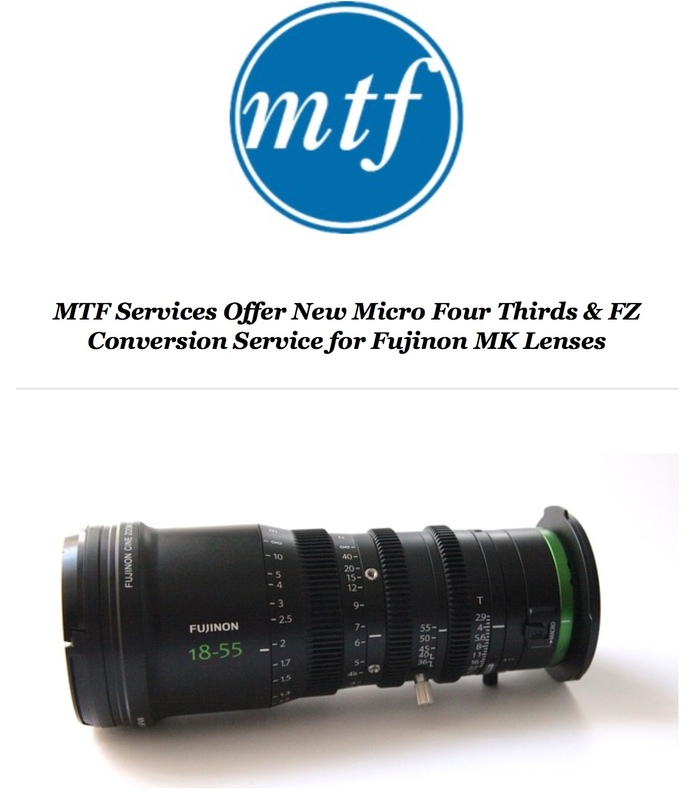 Well no surprises here to be honest but Mike Tapa of MTF has already finalised the design of an adapter that will allow users of Sony’s still to be released PMW-F3 to use low cost (compared to PL) Nikon DSLR lenses. This open up a huge range of lens options and I’m quite sure that with good high end lenses the results will be very good. It’s certainly the way I will be going.